Here's the review I did of Stephen Duncombe's Notes from Underground: Zines and the Politics of Alternative Culture for Maximum Rocknroll (issue #312, May 2009). 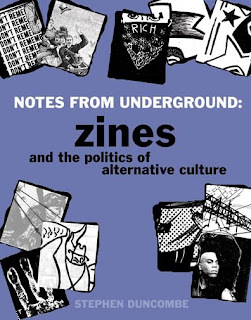 Notes from Underground: Zines and the Politics of Alternative Culture is not only a history of zines, but an attempt to theorize the existence and meaning of zines throughout this history. Originally released in 1997 by Verso, it has been re-released in a new edition for 2008 by Microcosm Publishing. Stephen Duncombe traces the zine movement back to sci-fi fanzines of the 1930s, and even the early political pamphleteers. 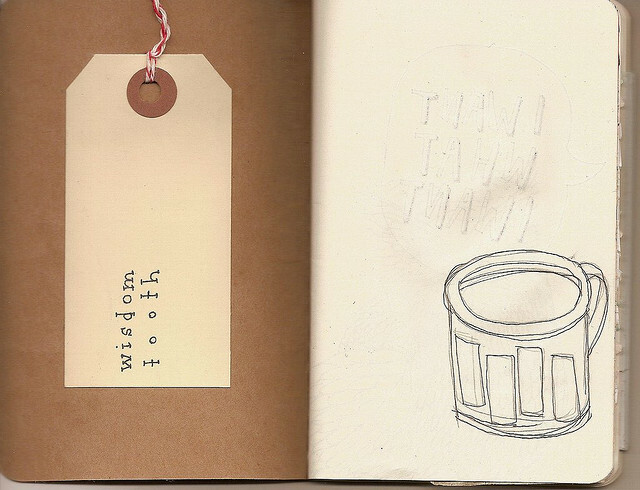 This is not a zine collection, nor is it a primer on zines. I’ve never come across a book quite like this, as zines are primarily self-contained, and most literature about zines does not analyze the zine world itself. Here, Stephen Duncombe takes zines and places them in their social context: the underground, and extrapolates on why they are such a necessary tool in this network. Duncombe draws his analyses directly from zines and their authors, as well as his own experience as a zinester, and his social and political observations of the underground community, with a scholarly lens. For folks who are interested in resistance (sub)-culture, Notes from Underground illustrates the radical act of self-publishing and why zines have been so instrumental to people on the margins. The book strikes me as something a liberal arts college professor who has no experience with youth culture would eat up with a spoon. This comes as no surprise, as Duncombe is a professor himself. Regardless of, and in concurrence with its appeal to the academic sphere, Notes from Underground is quite helpful in analyzing the underground print world, and enthusiastically illustrating the pros and cons of its existence. Duncombe’s approach is unique – an academic analysis through the eyes of an insider. This perspective guides his observation. Duncombe does not only cover the motives, cultures, and purposes behind zines, but also points out the intricacies of their humor, their unique style, and quite often, their biting sarcasm. Closing on the note that zines do in fact still matter, Duncombe makes the case that zines are not merely publications – and Do It Yourself ethics not just a practice -- but “an entire way of thinking, being and creating; a shared ideal of what culture, community, and creativity could be.” Creating even a non-linear history and analysis of zines is no easy task, yet Duncombe does so with enthusiasm and insight.